AMBUCS = No Limits, Just Fun! Riding Along, Sporting My Rabbit Ears! It’s January in the South; one of those crazy days where the temperatures reach into the 70’s– it’s bike riding weather! All winter long Rhema’s AMBUCS bike has been safely nestled, waiting for this Spring-like day, when it’s little bell would be heard ringing over the crispy crunch of dried leaves and brown grass. “Hey Rhema, you want to ride your bike today?”, I ask. Her big blue eyes sparkle to life, a warm smile spreads across her precious face, “yes” she whispers, quickly followed by vigorous nods of excitement. Rhema’s enthusiasm is not typical like most little girls; there is no screaming or jumping. Rather, her enthusiasm is measured by the “nods”. Offers to ride her bike are always greeting with multiple, head nods, where her little blond curls go flying through the air like little exclamation marks. Daddy and momma suit her up with her little leg braces, AFOs, followed by her little tennis shoes. No big braces needed for this activity, those big guys are reserved for walking practice. We hoist her into the seat only to find that she’s grown again; Rhema shrieks in protest when we remove her momentarily to adjust the seat. We quickly reassure her that she IS going to ride, but daddy has to “fix” the bike. “She ‘s grown again, she will be ready for a new bike in no time,” Daddy remarks as he makes all the necessary adjustments. Back on the bike Rhema goes and we strap her little feet, braces and all, onto the pedals. Rhema immediately begins to push, rocking the bike back and forth. As I watch my little Miracle girl, pushing those pedals with her little nerve damaged legs, I think, “her little legs are getting stronger. I’m seeing less and less atrophy from her recent bilateral feet surgery.” We head out the front door, pushing the long handle attached to the back of the bike. Once we get her onto the drive way, we give her a push and Rhema takes off, giggling all the way. Bike riding is very much a “family event” as Rhema still does not understand the concept of turning. So we trade out racing along behind her keeping her on the pavement. Daddy gets out in front of her and goats her into chasing him; I follow behind, making sure her pursuit stays on course for the inevitable “catching” of Daddy. These are the moments where we all forget about Spina Bifida, Hydrocephalus, nerve damage, surgeries, hospitals, emergency rooms, etc…. In this moment, we are a typical family, enjoying time with our little girl, while she rides her bike. In her dust she leaves behind wheelchairs, standers, gait-trainers, walkers, and long-leg braces. This little, red, shiny bike transports us all into a place of freedom we seldom get to stay in. 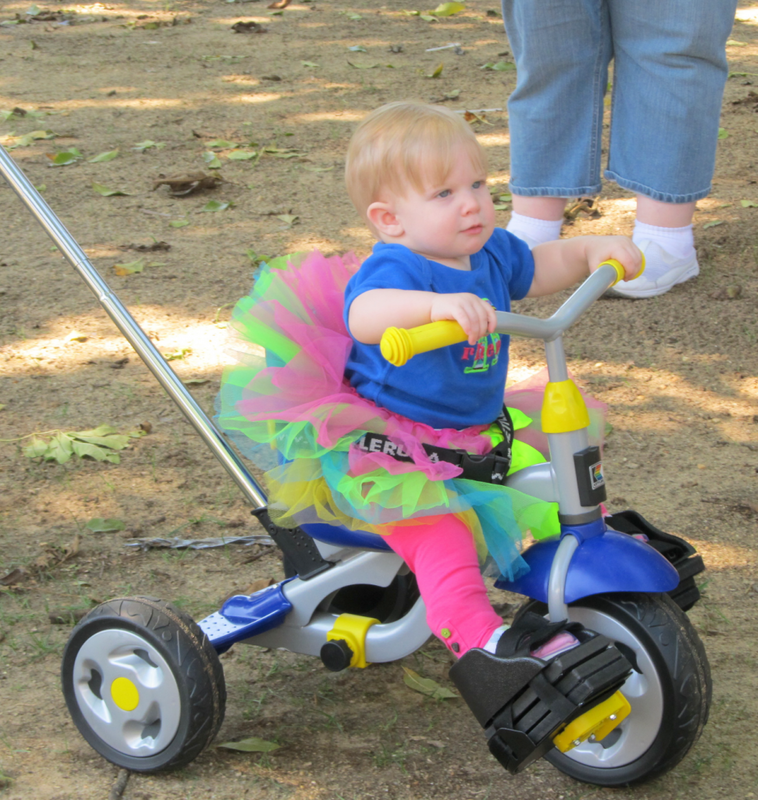 This AMBUCS bike levels the “field of play” and Rhema zooms along enjoying herself, just like any other kid. This is what AMBUCS is all about — leveling the “field of play” for those,who without AMBUCS, would never ride a bike, would never get to experience this wonderful, fundamental experience . 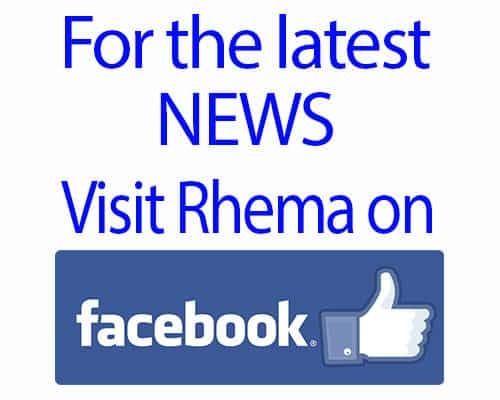 Our Rhema is one of these individuals. Shortly after Rhema’s birth, with it’s surprise diagnosis of Spina Bifida with Hydrocephalus, I remember thinking about what all she might not be able to do. The physicians gave us their prognosis: Rhema would be paralyzed in both legs, making walking unattainable and with the blood on her brain and pressure there was a possibility she would have severe mental challenges. Today, I’m proud to say that overall, they were sorely mistaken. For the first year of Rhema’s life, her diagnosis was so new to us and her condition was so critical, that I just accepted the losses and moved on. I vividly remember walking through a toy store, seeing the bikes and tearing up thinking that my little girl would never be able to ride. At the end of Rhema’s first year, we moved back home to be near family and we attended our first event in the Spina Bifida community. It was comforting, and yet overwhelming, to be among so many children and families affected by Spina Bifida. While meeting folks and wondering around the booths, I spied a little red bicycle being ridden by a little boy wearing long leg braces. I ran over to the booth, bearing the letters AMBUCS. I remember the excitement I felt, my heart leaping in my chest. The thought racing through my head, could my little girl really ride a bike? The AMBUCS representative was so kind and wheeled out the littlest bike I’d ever seen. She began asking me questions about my daughter’s truck control, her hip extension, her leg strength, all the while adjusting the bike and nodding as I answered the stream of questions. “Okay, well let’s get her on this and give it a whirl,” she said patting the seat of the newly adjusted bike. My husband did not hesitate, he quickly grabbed Rhema, plopped her onto the seat and began buckling the seat belt. We strapped in her tiny little feet and stood up. I could barely see through my tears; there she was, my little girl, sitting on a BIKE! Here was a sight I never thought I’d see! 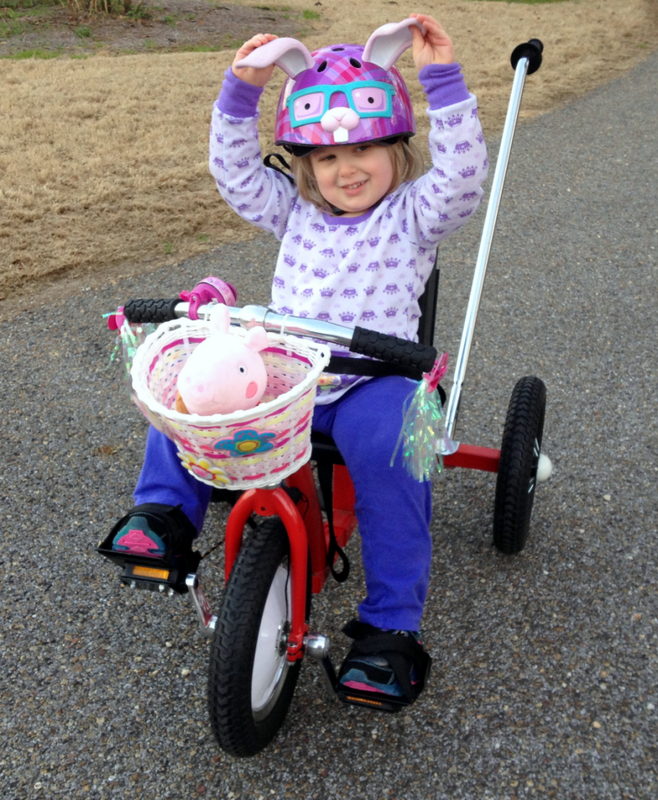 Rhema was tentative at first, but then she pushed on the pedals, moving the bike slightly forward. The AMBUCS rep prattled on about modifications and about how it was excellent physical therapy; her spiel was but noise, for my little girl was sitting on a BIKE! All I could think about was the accepted losses I had swallowed over the last year. Each one was now being called back into question. IF riding a bike was no longer an impossibility, then what other accepted losses were really attainable? You see, my momma’s heart had HOPE breathed into it that day– all because of a shiny. little. bike. I am forever grateful to AMBUCS for giving my daughter a childhood filled with fun, zooming around on her bike, her blond ringlets blowing in the wind. Because of AMBUCS my little girl will never have missed out on this fundamental childhood experience. That loss will simply NEVER be a part of her history. That’s HUGE! When so much of her Journey is riddled with loss, riddled with missed experiences. AMBUCS provides much more than a bike to our kids and families– it gives back what was robbed. It provides a way where a kid, any kid, no matter their physical challenges, can just be a kid. AMBUCS, you’ve blessed us beyond measure and for that we are proud supporters of our local chapter– AMBUCS of the Wiregrass!